Building upon the Tribel stainless steel frame, THE TRIBEL GRAN TOURISMO inherits the technical strengths and durability of the Tribel Original while pushing forward the boundaries of elegance in the toy segment. Filigree spokewheels with withewall tires replace our standard wheels, the grip is taped with real leather and a Brooks Leather Saddle tops of the exclusive appearance to meet your high demands. 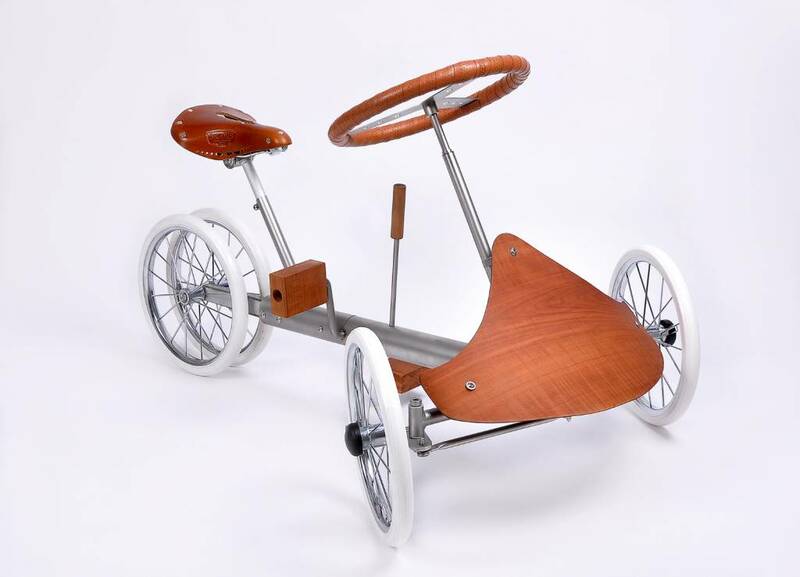 Our children’s tricycle is a reinterpretation of the approx. 40 year-old vehicle called "Liliput". We have been inspired by the esthetics of the original vehicle and have transferred those ideas to a more contemporary design language. 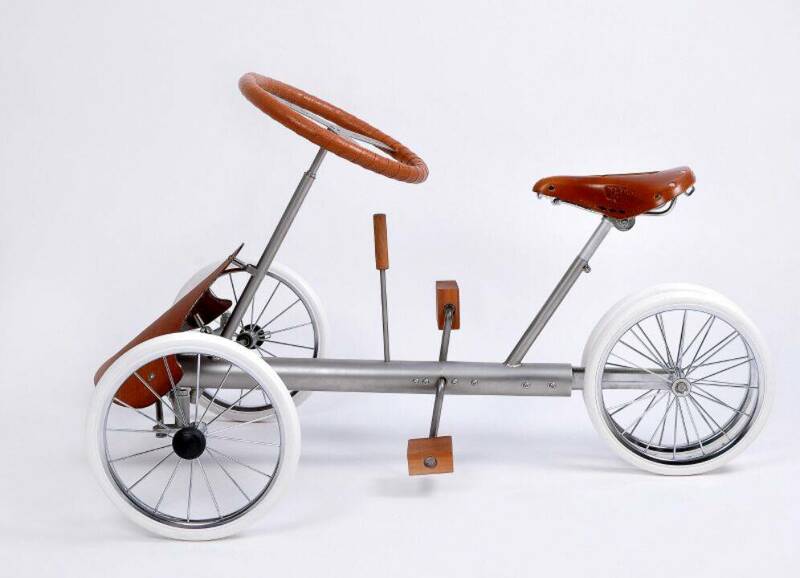 High-quality materials, such as the genuine pear wood of the pedals, are in strong contrast to the stainless steel or aluminum of the vehicle frame. 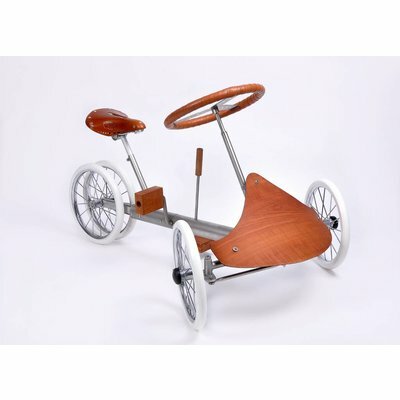 The combination of linear design with high-quality materials and the latest technology make our Tribel tricycle an absolute must-have item for your child. We never lose sight of your children’s driving pleasure and would like to make your family’s leisure activities more dynamic. Your child’s creativity will be activated by the straight design of pour products. The driver decides on his own whether he wants it to be a racing car, a fire engine, a police car or even a royal coach for princesses - we leave room for your children to bring in their own ideas when playing. At the same time we give priority to the safety of your child. Therefore our Tribel tricycle is also suitable for novice drivers of 3 years and above. A track width of approx. 60 cm and the handbrake that can easily be engaged guarantee your child’s safe driving. Steering is done just like in a normal car and your child can already practice correct parking, driving forwards as well as reversing. Our FRONT SPOILER is of composite material laminated with Swiss pear wood veneer. It can be mounted or removed easily with a few tools. Currently there are two design versions for you to choose from. The STEERING of the Tribel tricycle is done using a classical steering wheel, like the one in a go-kart or kettcar. Our tricycle is particularly manoeuvrable owing to the quickly responsive steering. That gives the young drivers the most fun. The maintenance-free TOOTHED-BELT-DRIVE looks beautiful for sure - however, we still place it in a hidden position. Because when everything is put inside the steel framework, your child’s clothes will remain clean. The 1:2 transmission ratio facilitates racing starts and the fixed gear gives a better feeling for the speed the vehicle is running. Everything under control – to brake, you simply push the BRAKE LEVER forward. Just like the cam belt, so is the brake linkage guided safely in the frame. That protects your child’s clothes from damage and gives our tricycle a minimalist and fine design. The Tribel ticycle is equipped with a high-quality BICYCLE SADDLE. This can be adjusted variably in height with a few hand manoeuvres.